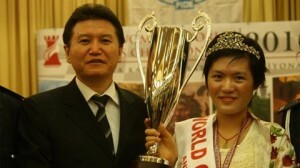 The World Chess Championship 2012 for women is going to take place November 9 – December 3 in Khanty-Mansiysk, Russia. Every odd year (ex 2011, 2013, 2015) the championship is a 10 games match between two players. Every even year (ex 2012, 2014, 2016) it is a knockout system. A total of 64 players will participate in the Women’s World Championship this year. They include the World Champion Yifan Hou, the finalist from last year Humpy Koneru, the two semi finalists from 2010 Ruan Lufei and Zhao Xue, the World Girl’s Junior Champion from 2010 and 2011 Anna Muzychuk and Deysi Cori, 5 players by rating, 28 from the European Women’s Championships 2010 and 2011, 8 players from Americas, 12 players from Asia and Oceania, 3 players from Africa, and 2 nominees of the FIDE President. Below is a list of invited players for the WWCC 2012. Each of them has to confirm participation by the 28th of August 2012. The Championship has a total prize fund of USD 450,000. For participating in round 1 players receive 3750 eur, for round 2 5500 eur, round 3 8000 eur, round 4 12 000 eur, round 5 (semi finals) 20 000 eur, the silver medalist 30 000 eur, and the champion 60 000 eur.